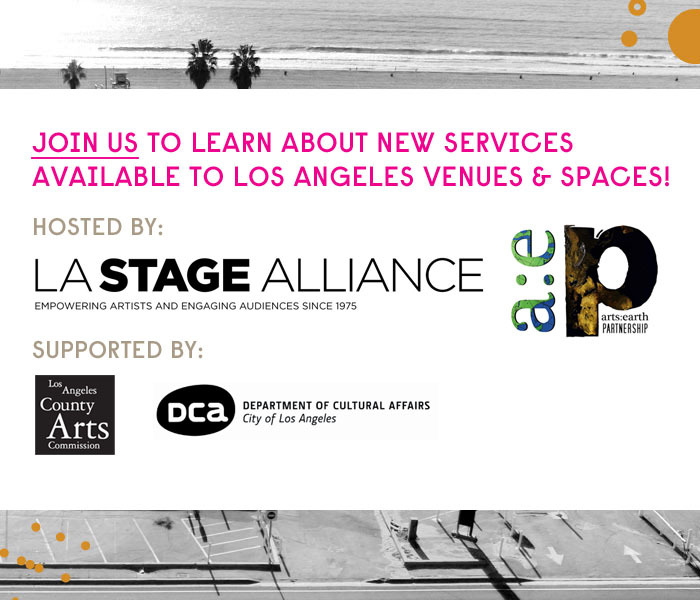 LA STAGE Alliance, Arts:Earth Partnership, and partners have several new services and features that can help you improve and manage your space, venue or facility, and help members of the Los Angeles community who are eager to use your space find you! Join them for a presentation on the growth of SpaceFinderLA.org and Arts:Earth Partnership’s green business certification program! CLICK HERE TO RSVP – It’s Free, but space is Limited! For Directions and Parking, please click here! 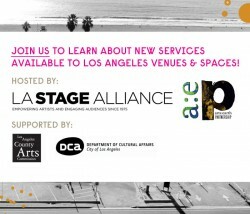 Terence McFarland of LA STAGE Alliance will talk about the inception of SpacefinderLA.org in Los Angeles, the growth the service has experienced in the last year, explain the history of the inception of Arts:Earth Partnership and how they are transforming the cultural facilities of our region. Adam Meltzer and Justin Yoffe of AEP will share details about how your organization can benefit by becoming a part of AEP’s expanding Green Business Certification program exclusively for the cultural sector – with 38 cultural facility members in the greater Los Angeles area already and 18 certified, AEP is leading the way in greening the cultural sector. Expanding missions and funding opportunities through the greening of your spaces will also be discussed. 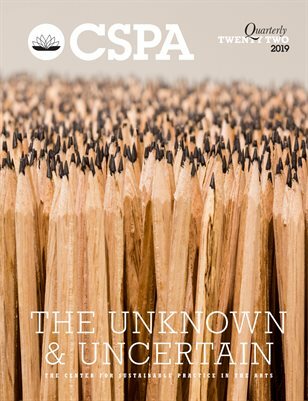 SpaceFinderLA will now also include the ability to search for film and visual arts related spaces – as the second largest directory of it’s kind in the country, SpaceFinderLA continues to add spaces on a daily basis, and to increase web traffic and searches by people who are looking for your space! This event is supported by the LA County Arts Commission and the Department of Cultural Affairs, City of Los Angeles. Just click on the link below and register. It’s free. Arts Earth Partnership (AEP) and NextAid are two long-standing Los Angeles-based nonprofit organizations that promote sustainability projects within the arts and cultural sectors. AEP certifies cultural institutions throughout Los Angeles to make them more sustainable and reduce their environmental impact. NextAid harnesses the power of dance music to support young entrepreneurs in urban centers in Africa, with a specific focus in Nairobi. Both organizations offer tangible results to today’s most pressing environmental and societal problems. 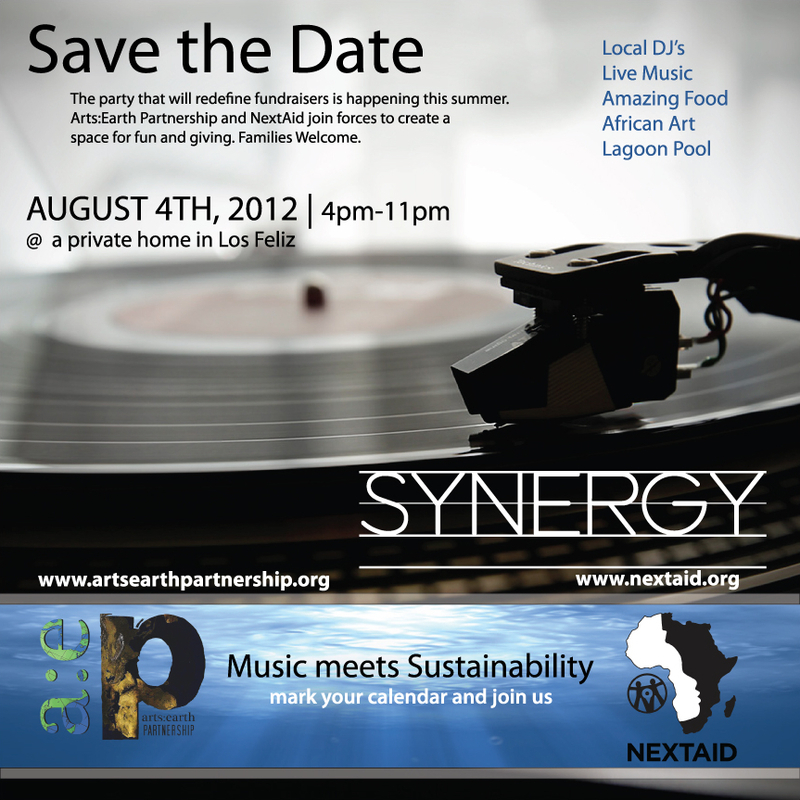 In a spirit of collaboration, AEP and NextAid are coming together for first time to raise funds for their vital work! At a gorgeous private home in the Los Feliz. HeatWave: LA’s Theatre Community Commits to the Environment. Register here to attend the HeatWave conference on June 9th by clicking here! 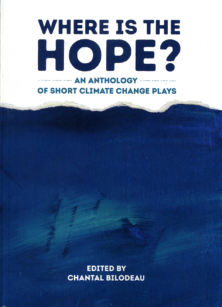 HeatWave is a project which brings together the professional Los Angeles Theatre Community – writers, devised theatre makers and producing theatre companies – to confront and grapple with environmental issues, including Climate Change and issues of Environmental Justice. HeatWave is designed to generate new works and connect the Theatre Community to the Environmental Community, as well as promote and facilitate greener practices in operations and production. Join us for our kick-off day-long event at TreePeople’s Conference Center in Coldwater Canyon Park. For more information about HeatWave and HeatWave events, visit www.HeatWaveTheatre.org! Green Public Art Consultancy will participate in a panel discussion, with Los Angeles aerosol artist ManOne and Justin Yoffe, Executive Director of Arts:Earth Partnership, about how artists can make green choices in their own art practice at Los Angeles’ Green Festival on Sunday, October 30 at 4:30pm. 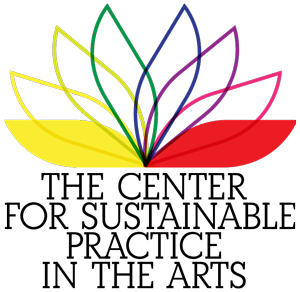 Green Festival, the nation’s largest and most trusted green living event comes to Los Angeles October 29-30, 2011. This unique experience celebrates positive solutions working in our communities. Festivities include presentations by more than 125 renowned authors and visionaries, DIY workshops, cutting-edge films, enriching kid’s activities, organic beer and wine, delicious organic vegan and vegetarian cuisine, music and art and an amazing marketplace of hundreds of green local and national businesses and organizations. Rebecca Ansert, founder of Green Public Art, is an art consultant who specializes in artist solicitation, artist selection, and public art project management for both private and public agencies. She is a graduate of the master’s degree program in Public Art Studies at the University of Southern California and has a unique interest in how art can demonstrate green processes or utilize green design theories and techniques in LEED certified buildings. Green Public Art is a Los Angeles-based consultancy that was founded in 2009 in an effort to advance the conversation of public art’s role in green building. The consultancy specializes in public art project development and management, artist solicitation and selection, creative community involvement and knowledge of LEED building requirements. Green Public Art also works with emerging and mid-career studio artists to demystify the public art process. The consultancy acts as a resource for artists to receive one-on-one consultation before, during, and after applying for a public art project. The purpose of this LEED category is to recognize projects for innovative building features and sustainable building knowledge. Projects are allowed 5 ID points. I personally have found it challenging to convince my building PMs to use one of their ID credit points for art…its not to say that it cannot be done but usually these points are spoken for pretty quickly. make the building actively instructional – signs, displays, kiosks, etc. provide promotional materials – brochures, web sites, etc. develop an outreach plan – tours, presentations, web site, etc. ID Credits are awarded for exceptional performance such as doubling the credit requirements and/or achieving the next incremental percentage threshold. Credits can also be achieved for comprehensive strategies which demonstrate quantifiable environmental benefits. I highly suggest reading through the ID Credit Catalog as a brainstorming exercise to see what other project have achieved. 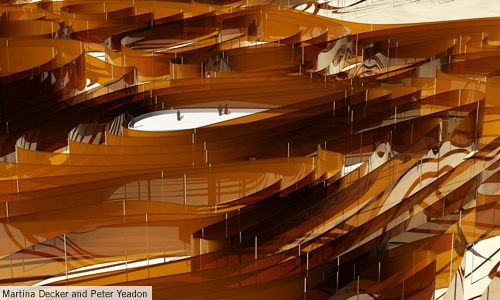 To go back to the beginning of the PUBLIC ART and LEED conversation go here: Green Building: Where Does The Art Fit In? Chrysalis Arts Public Art Sustainability Assessment Toolkit – The Public Art Sustainability Assessment (PASA) is a set of guidelines and an assessment method being developed by Chrysalis Arts, an artist-led public art company in the UK. PASA is intended as a tool for use at any point during the development, creation, maintenance and decommissioning of a public art project. Arts:Earth Partnership – is an official green certification for cultural facilities, art galleries, performing arts companies and individual artists. The Los Angeles based program, founded in 2006, is forming a coalition of certified artists and facilities committed to achieving environmental sustainability. Climate Clock – The Climate Clock is a unique educational public art project sponsored by the City of San Jose and San Jose State University. The project challenges artists to conceptualize a 100-year public art project to help measure climate change, make the process more visible, and engage and inspire the community to personally explore and modify their individual carbon footprints. The realization of the Climate Clock landmark will be the result of combined resources from partnering organizations and private philanthropy. To date, SJSU and the City of San José have contributed more than $150,000 toward the incubation of the Climate Clock concept. Land Art Generator Initiative (LAGI) – In 2010 the Land Art Generator Initiative, which is based in Dubai, challenged artists, architects, engineers and the like to design public art installations to continuously distribute clean energy into the electrical grid, with each having the potential to provide power to thousands of homes. Transition Town innovator Rob Hopkins noted that Ed Miliband used the notion of “transition towns” a lynchpin concept in the launch of his White Paper on Energy and Climate Change Policy. Determined to discover whether his movement was being used as window dressing or not, he publishes his own review of the paper giving the proposals 6/10. Meanwhile, LA continues to surprise by confounding its image as a megalopolis on on the road to hell. This Arts:Earth Partnership initiative, greening the city’s performace spaces, is interesting. About seventy people gathered on Friday, June 26th at the Santa Monica Museum of Art in Bergamot Station to celebrate the launch of a new organization that uses only one color in its visionary design: green. The kind of green that speaks to fresh foods, verdant forests, sustainable living and a healthy planet. In the main gallery, several speakers addressed the audience, including Ken Genser Mayor of Santa Monica, Ernest Dillahay, Director of Cultural Facilities for the City of Los Angeles, Justin Yoffe, Cultural Affairs Director for the City of Santa Monica, and Joel Shapiro, Artistic Director of the Electric Lodge in Venice. They shared their vision to reduce, recycle, reuse and rethink energy in measurable ways that are specific to the cultural community. The mood was leisurely, but the message from behind the podium was passionate: for the creative community to take a leadership role in halting the effects of global warming, we must think and act differently now. The mechanism to do this is The Arts:Earth Partnership. Not some utopian fantasy, The Arts:Earth Partnership, or AEP, is a collective of cultural leaders, facilities, theaters, museums, dance studios, art galleries, performing arts companies and individual artists committed to achieving environmental sustainability. AEP co-founder Joel Shapiro told the audience that 25,000 people come to the Electric Lodge each year. The energy of this performing and visual arts space is supplied by solar panels. To rent the space, independent producers are required to have a recycling plan for their sets, and all front of house and off stage lights are energy efficient. Shapiro said that he and Justin Yoffe, who is the board president of the Lodge, got the idea for AEP when they started to wonder: what if more facilities shared the same philosophy as the Lodge? How many theaters or galleries or performing arts centers would share resources, reduce their own costs and contribute to the health of the planet? How many people would learn about the cost savings and start to make changes at home? They started doing research seven years ago and found that bloated applications, expensive start up costs and programs that did not meet the needs of cultural organizations made ‘going green’ a black hole of despair. They decided to develop a new model, one that would make sense to most non-profit organizations whose daily work is often characterized by stretched dollars, resources and staff. Shapiro and Yoffe started knocking on doors. The cities of Los Angeles and Santa Monica answered and joined with them as AEP founding partners. The City of Los Angeles pledged to convert all of their cultural facilities (30-35) into certified sustainable operations. 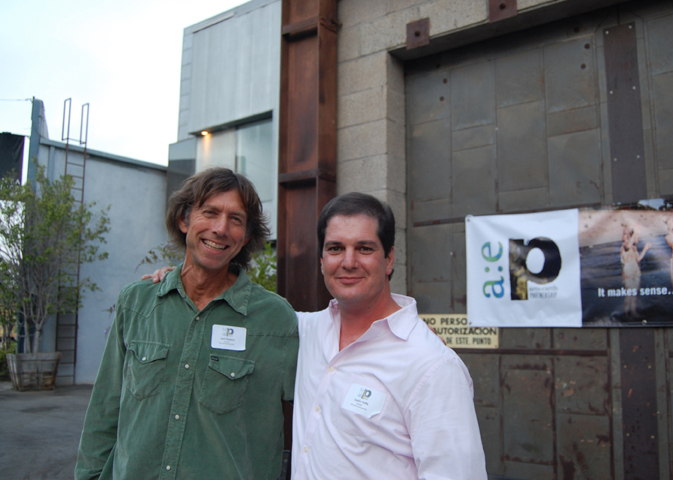 Santa Monica also connected AEP to their own resource for going green, Sustainable Works, the non-profit organization that, in four years, has helped convert 35 businesses into green companies. The staff at Sustainable Works trained AEP auditors to conduct energy use assessments at cultural facilities that want to reduce their environmental impact. AEP offers a two-year certification program that includes the assessment, tools, resources and staff support for changing to green technology and practices. Organizations pay a fee for the service and then become members of the collective. Fees are based on the size of the organization’s operating budget. To attract more organizations of all sizes, both Los Angeles and Santa Monica pledged to pay the first year of the two-year AEP certification fees for the artists and organizations that signed up at the reception to join the collective. Jan Williamson, Executive Director of the 18th Street Arts Center and AEP advisory board member talks with Joel Shapiro. Shapiro said that certification requires each member to use at least 25% renewable energy. The Lodge itself is the gold standard, using 100% renewable energy. In the first year, with 30 current members using at least 25% renewable energy, AEP will reduce CO2 emissions into the atmosphere by 50 tons. That’s roughly equivalent to the annual output of 7 households of 4 adults each. It may not sound like much, but the more organizations and artists join, the more CO2 emissions will drop, the more the creative community can help tip planetary scales back towards balance and inspire others to do the same. Indeed, it’s working already as 25 artists and 25 cultural organizations signed up on Friday. AEP will track the progress of certified members, as they change from wasteful to efficient energy use and then publish its findings in an annual report. AEP plans to hold annual ‘convergences’ so that cultural leaders can learn from each other by sharing stories, news and information. On their website, AEP also offers a materials exchange board, a resource especially suited to theatres and galleries that rotate sets and exhibitions and frequently use production materials. After the speeches, small groups hovered near the podium, eager to continue the conversation. 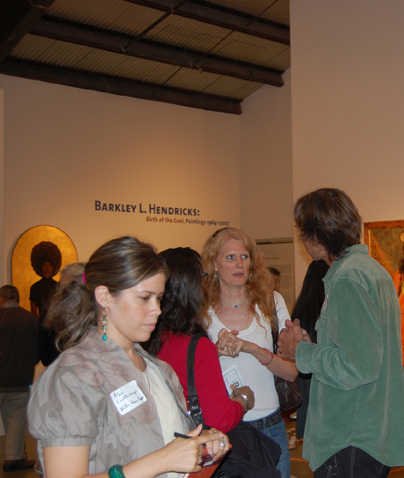 The rest of the crowd took in the exhibition of Barkley Hendrick’s bold life-sized portraits, or wandered out into the warm evening air and over to the literature table and makeshift bar. Next to the bar was a sporty car that had been turned into a planter, with succulents and cacti bursting from its windows, trunk and hood. If you can envision a world where abandoned cars are ideal places for gardens, then AEP is an organization that needs your energy (renewable, of course) and commitment to paint the world green.